It’s after dark and my friends and I have joined the creatures of the night. Our simple camp is set up on a sandbar and my friends are shining our spotlight up and down the banks of the river, hoping to spy the movement of a PVC pole bouncing frantically. A quick check of the first bank pole shows that something is struggling on the end of the line. 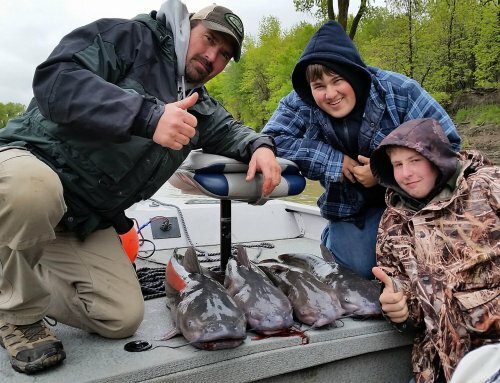 As the flatbottom boat glides in beside the dancing pole, a net dips swiftly into the muddy water, revealing our prize- a chunky Flathead catfish. The fish is unhooked and held up for a quick photo, weighed, then released back into the murky depths of the river to see another day. A new bullhead is placed on the hook and we are on our way to the next pole set on the riverbank. We still have 14 more poles to check before retiring to camp for a short break prior to our next check of the night. During our pursuit that night, we boated and released 7 flatheads and another half dozen channel cats. Bank poling, or ditty poling as some may call it, is a common pastime among Iowa’s “river folk” and the mere mention of the act will often entice old-timers to tell stories of giant catfish hooked using this method in their youth. Bank poling is very popular in some areas of the state, especially in areas nearing the Mississippi River. 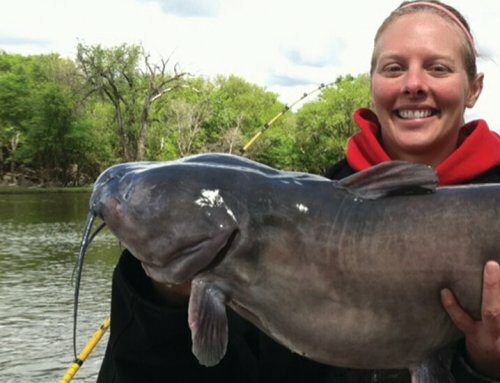 It’s an easy, relaxing way to spend a summer night cruising the river with a buddy and often produces some truly spectacular results with a chance at a large catfish. Bank poling in its entirety is a simply means of fishing. The investment in tackle is quite low and the tactics are more like setting a trap than actually fishing. You are however trying to catch fish so your motives should focus efforts on areas where a catfish may find your bait. Bank poling is a tradition among many anglers and what lies at its core are secrets, stories and memories that get passed down among the generations of catfish anglers today. Bank Poles can vary quite a bit, depending on who made them. Most poles are between 5 and 10 feet long, and must be strong enough and flexible enough to support a large catfish struggling. PVC is often the preferred material, usually in 1/2’”- 1” diameter as it is relatively cheap and easy to find at any hardware store. Some use fiberglass poles, such as golf flag poles because of their strength, but these can be tougher to find. Still others use the more traditional willow or cane poles. These work very well, and offer the advantage of camouflage from other people who might “check your lines” for you. The biggest disadvantage of natural poles is the fact that they must be replaced at least every year, if not more frequently. Beyond the base material, the hardware used will vary widely as well. Most people use heavy braided mason twine for line. I prefer to get my twine tarred to resist rotting and prevent it from weakening. Some people use sinkers, others do not. This mostly depends on whether you choose to fish your bait near the surface or off the bottom. Most people think of fishing their bait on the bottom when they think of catfishing. This is not necessary, as both channel catfish and flatheads will not hesitate to swim up to the surface to grab an easy meal. Run about twenty feet of line on your poles. This allows for adjustments in bank height, water depth and fishing reach and can be adjusted on the fly by wrapping or un-wrapping as much line as needed and looping a quick cinch knot around the top of the pole to keep a catfish from unwinding the line during its fight. The ways to make your poles are endless. Everybody has their own method that they will swear by. I might fish my bank poles differently than many people do, but no matter which design, there is one thing in common- They all catch fish. The following illustration shows a simple bank pole made from PVC and few common materials. Channel catfish can be caught on a wide variety of baits, both dead and live. Many of the same baits used when fishing for them with rod and reel will work as well on bank poles. Shrimp and cut bait are some of the most popular choices when setting poles specifically for channels because of the fact that these baits can’t swim around and get tangled on roots underwater like a live sunfish can. Live bait can also be deadly on channels and some of my best nights have been using live sunfish for channel catfish. Flathead catfish, on the other hand, will rarely eat anything that is not alive. Live bullheads and sunfish are the most popular choices because they are easy to catch in large quantities and are hardy fish. Keeping your bait lively and swimming is important when fishing for flatheads and both bullheads and sunfish do fairly well when hooked. 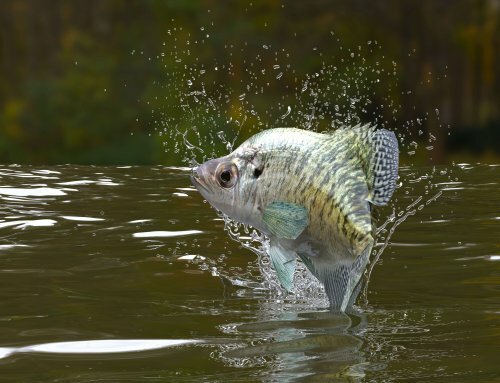 Being able to catch large quantities of bait is important because with three people and fifteen poles, it is entirely possible to go through sixty or more baitfish in a night. Location is everything when targeting any species of fish and the same holds true for catfish in rivers. When targeting flatheads, your aim should place your bank poles in areas where the flatheads seek food upon leaving their daily hides. These areas may include the front sides of brush piles, the upstream side of deeper pools, along rip-rap banks or even the edges of large gravel flats. It may be surprising how shallow a flathead will roam in search of a meal. When targeting channels, the same locations that produce flatheads will also work. Other areas that are top spots include steep cut banks, slack current areas near structure, outside bends and deeper sand flats. Rigging the bait is quite simple in most scenarios. For live bait such as bullheads, sunfish and small carp, simply hook the bait just behind the dorsal or adipose fin in the fleshy area up from their lateral line. Be careful not to hook too low or you will risk puncturing their spine and nerves causing the bait to die or resist swimming. For cutbait and other dead or manufactures baits, simply hook them as you normally would for rod and reel fishing. Be sure to clear all scales away from the hook point before tossing the bait into the water. I like to use a #6 to #8 circle hook for all of my bank poles. Presentation is probably the biggest question most people have when setting bank lines. There are two applications; one involves suspending the bait off of the bottom and the other is letting the bait rest on the bottom. Both methods will produce fish. Suspending the bait is a great way to fish for flatheads, especially in or near cover and in water less than three feet deep. In this application the rig is virtually snag free and the bait is forced to swim constantly, which in turn draws hungry catfish up for an easy meal. Wrap or unwrap your line and adjust the bait so that it hangs about a six inches to a foot below the surface. If the current is strong enough to sweep your bait to the top you may need to weigh the bait down by placing an egg sinker roughly six inches above the hooked bait and dropping it down a little further. 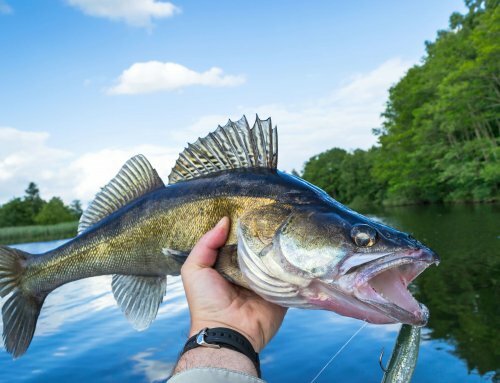 Fishing your bait on the bottom may be necessary in deep water, areas where the current is high or in areas where you physically need to get your bait out away from the bank to reach key spots. Areas where you should avoid placing the bait on the bottom are locations such as timber snags and roots that stick out from the bank. In this case a struggling catfish or your lively bait can easily wrap you up in the debris and potentially come off. Use a sinker such as a no-roll that is heavy enough to hold in the current, yet light enough so as not to deter strikes from a hungry fish. You can also use a 3-way rig with a pyramid or teardrop sinker to get the bait slightly off of the bottom in higher current scenarios. Iowa’s rivers are one of our most interesting and unique natural resources. They are constantly changing and incredibly diverse in terms of both landscape characteristics and fish populations. It has been said that you will never visit the same river twice. This is very true, every time I go to one, it is a little different than the last time. Water levels, shifting sandbars, fish patterns, and river obstacles are constantly changing and keep you on your toes when fishing and navigating in a boat. The other great characteristic of Iowa’s rivers is their mysteriousness. It’s hard to tell exactly what lurks beneath the surface. The muddy rivers of Iowa hide their contents from sight and only provide a few clues as to what lies below. Tales of giant fish have been told for generations, and you never know what you will find. The ever-changing environment, coupled with the dark, muddy waters leave anglers guessing, and speculation is as far as you get. This appeals to many of the people who use the rivers for their recreation. Iowa law for bank poles allows up to five lines per licensed angler and requires that they are checked at least every 24 hours. Lines that are not being checked daily must also be removed. Bank poles also need to be attached to the shore and require a tag including the angler’s name and address. Setting bank poles is not permitted in lakes or within 300 ft of a spillway and are not allowed in nine counties in northeast Iowa- Mitchell, Howard, Winneshiek, Allamakee, Fayette, Clayton, Delaware, Dubuque and Jackson. There are some exceptions within these counties, so be sure to check the Iowa Fishing Regulations before setting bank poles in these counties. The daily bag limit for catfish in streams and rivers is fifteen, and the possession limit is thirty. Where allowed by Iowa’s Meandered Rivers laws, I prefer to tend my poles all night. I set up a simple campsite on a sandbar, consisting of a tent and campfire to cook supper over. The tent is a backup plan in case of heavy rain or if the fishing is slow, but I often plan to check the poles regularly until dawn. Flatheads, especially, are primarily nocturnal and nighttime is the best time to catch them as they leave their daytime resting areas and prowl the shorelines for their next meal. If practicing catch and release on large flatheads, this also increases their chances of survival by removing them from the hook sooner than if they were only checked in the morning. Doing things in the dark makes every little task more difficult, and even river navigation becomes more challenging. The darkness also masks things above the waterline. Partially submerged logs can be difficult to see in the daylight, and nearly impossible at night with only a spotlight to aid in navigation. To avoid damaging an outboard, extreme caution is needed when boating on rivers at night. As soon as my friends and I are finished pulling out the poles in the morning and returning to the boat boat ramp, we have already made plans to explore a new stretch of river the next weekend in search of more cats. 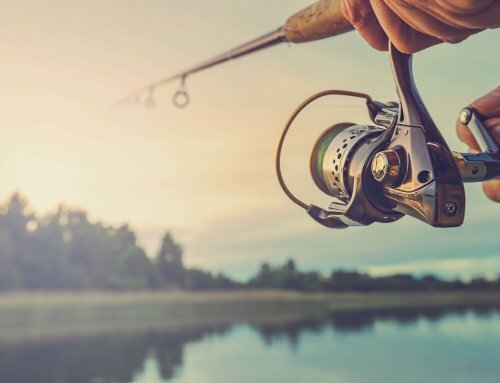 Iowans have fished with bank poles for decades, and it remains a popular weekend activity in many of its rivers, providing a highly productive alternative to rod and reel fishing for catfish.